Permanent premium pigmented ink is non-toxic archival quality acid-free and lightfast. * Non-bleed ink is also water-resistant and smear-resistant when dry. * Results may vary based on paper characteristics. * Ideal for crisp lines and detail work in artistic and technical drawing applications. * Great for quick sketching outlining and creating texture. 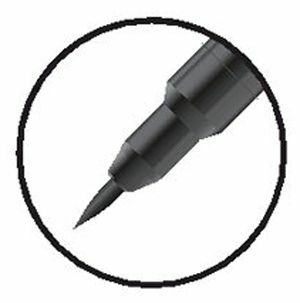 * The brush tip marker is ideal for creating thick thin or varied lines with one stroke. * Created for the artist who loves the control and flexibility of a brush. * Ideal for the professional that wishes to create with smooth flowing areas of color or intricate details. 5.5" x 0.38" x 0.38"